Roots' expansion is underway. Won't be expanded until late summer/Fall (which probably means end of the year, if their construction is anything like every other construction project I've heard of). Two Belgians are on the way for March and April. On the equinox (3/20), the brewery rolls out Jason McAdam's Belgian brown ale--which also happens to be the entrant in the Cheers to Belgian Beers contest. And in April, they release a Flanders red that's been sitting on oak for a year. It's hard to miss our new solar thermal hot water panels as you approach our pub. We've got 16 four foot by ten foot panels gathering hot water from the sun. Today it's partly cloudy and 43 degrees and we are pulling down over 100 degree water! We can't wait 'til summer! Keep you're eyes posted for a solar powered beer. This is the first commercial brewing application of solar water heat in Oregon and you can drink the results! No idea how old the posting is, and I find no other reports of it online. Until now. Prost! After working with Oregon Tilth for nearly six months, Deschutes Brewery received organic certification for its 50 barrel brew house. The brew house, built in Oregon by JV Northwest, was the anchor of the brewing facility built in 1993 that expanded the operation outside of the original brewery and public house. After brewing 20,000 batches of beer, it now meets the stringent standards of the National Organic Program. It's not actually clear to me whether this means the entire brewery is going green, or if the brewery has to be certified even for a single beer to be certified. Either way, Deschutes once again shows its attention to detail. I'll try to track down a bottle of Green Lakes and see how it measures up. Thank you for your comments and questions about authenticating standard pint glasses. The Measurement Standards Division has the responsibility to ensure that commercially used weighing and measuring devices are licensed, tested, accurate, suitable and used correctly. This testing ensures the consumer gets what they pay for when buying commodities across these devices, such as verifying that a gallon of gas is really a gallon of gas. We also have funding for the testing of motor fuel Quality. This ensures the consumer that the quality of gasoline meets national standards. Weighing and measuring device license fees cover the cost of these programs. In addition, we receive a small amount of funds for transaction verification. This would be verifying the net contents of packaged products. Due to very limited funding, at this time we are focusing on checking in-house packed items such as packaged meats at your local market. There are other areas that we would like to have a presence in the marketplace; if at some point additional funds become available we will look at expanding our current inspection program. In the meantime, we will continue to use the funds available to us as efficiently as possible. At this time that does not include checking all of the restaurants and bars to ensure that a pint sized glass is in fact 16 fluid ounces. While this does not solve your problem I hope you will understand our position. This seems both predictable and probably accurate. It's one of those things that falls under the Measurement Standards Division's balliwick, but for which there is neither a policy directive nor funding mechanism. Since I dabble in politics, maybe I'll see if I can track down someone who could tell me how we'd go about getting policy drafted for this. As always, thanks to everyone who signed the petition--I have not abandoned the cause. I know this is Beervana, and I know that there's probably not great interest in Hawaiian beer . That said, my travels were instructive enough that I think there's something worth bringing back to the mainland. Leaving Kona aside (I'll come back to it in a minute), the two smaller breweries had a distinctive quality in common that I have to contribute to the water. I tried four of the Mehana beers and one of Keoki's, and the quality was the same--an unusually acidic, quasi-Belgian quality. It was as if they were hyper-carbonated, but not fizzy. It harmonized most delightfully with the Mehana pale and porter. Both could have passed for Belgians; the former seemed a little like an abbey ale (though lighter), and the later was Belgianish, but uniquely so. Instead of finishing creamily and sweetly, they had a sharp, tingling tartness. 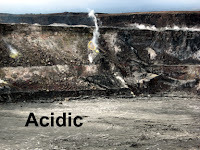 When I took a coffee tour, the guide said that the soil is acidic, and later, when we visited the volcano, I saw why--the blasted landscape is scrubbed by intense acids that can devastate plantlife merely by wafting by. T he tap water is full of minerals and is slightly sour. Oregon is famous for having soft, neutral water that contributes very little to the beer (but doesn't interfere with the malt and hops), so I am a little unused to sussing out this quality. But boy, is it obvious in these beers. Kona, weirdly, is a standard-tasting West-Coast style brewery. I suspect they treat the water to address this, but I can't confirm it. Their beers taste much like an Oregon brewery. If you make it to the Islands, definitely try the local beer--it's an education. Passion fruit has a very hop-like signature. As attendees of the OBF know, Kona has a passionfruit wheat. I have found it t too sweet and assumed it came from a mass-market brewery, but when I had a whole pint and compared it to Sally's muscular IPA, I recognized what they were going for. I'd love to see it used in an IPA, in greater moderation, to see how it would accentuate some chinooks and centennials. The water here is hard and acidic (I think), bubbling as it does through caustic volcanic flows. That gives the beer a rather interesting signature. 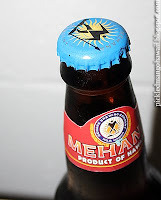 The Mehana pale especially has a strange, almost Belgian-like tartness. Yet another installment about beer from Eric Asimov, the NY Times' beer guy (or wine-guy-who-writes-about-beer) and yet another column in which no Oregon beers are mentioned. I mean, I don't ask for much. But in a review of extreme beers, a nod to Beervana wouldn't be out of the question, right? Right? Hair of the Dog has been brewing extreme beers for 15 years. Sasquatch became a fave over a decade ago. For years and years and years, Oregon beers were castigated for their heft by brewers and writers on the East Coast and the beer mafia (sorry!) in Boulder. Yet Asimov selects five East Coast beers and two Colorado beers. Pshaw! (Hoisting a pint of Hair of the Dog Fred) "Hey Eric, say hello to my leetle friend." How Many Ounces is an Honest Pint? We here at Raccoon Lodge and Brew Pub want to comply with the honest pint movement. We need clarification. Is the glass 16 oz to the rim or is the glass 16 oz of beer + head to the rim? And if the latter, who is a good supplier? Good question. There are three answers, reflecting the reality of the current situation. Since I'm spearheading this, I've worked up my own criteria, but I recognize that I'm not the final authority. But here's my take. Minimum standard - a sixteen-ounce glass at the rim. Effectively, you'll be getting in the 14-15 ounce range per pour. There are shaker pints that conform to this standard, and if all the Honest Pint accomplished was to provoke a switch to them, I'd be satisfied. Best standard - In England, pint glasses have a little head room, and an etched line that signals the full pint. Publicans employing 17- or 18-ounce glasses would be offering patrons a full pint of liquid. It's the less-weaselly solution. Alternative standard - many pubs actually use the English pint glass, delivering a full 20 ounces to consumers. This is an instantly recognizeable glass, with its characteristic bulge near the top (and to my mind one of the prettiest). Pubs using these generally note that they're 20-ounce pints or "imperial pints." To add even more granularity to the conversation, I'll point out that the good folks at CAMRA (The Campaign for Real Ale in Britain) have their own effort to end "short pours," including an online petition. I foresee a time when Oregonians, satisfied that their glasses are honest pints, will push to end short pours (a scourge Doc Wort decries). But I'll take a simple switch to 16-ounce glasses. I realized that my youth was gone a few years back when I realized that I had, to the eyes of the undergrads at the college where I work, turned into a specter. I became not quite invisible--they still dodge around me when we're on a collision course--but something like a bush or a trash bin. Turning forty merely puts the period to the end of the sentence. However, I grieve none of this. In compensation for my lack of youth, I have the gathering wisdom of age. Example: 21-year-olds get drunk on crappy beer. But at the ripe old age of 40, I know better. I plan to christen my ruby anniversary with something a little more rare. But what? It's not a choice I should or will take lightly. I imagine it should have some or all these characteristics: rare, aged, strong, intense. So, what do you suggest? Got any leads? *Falling off the places you want it, growing on places you don't want it, and getting gray on all the places. The conclusion? 15 ounces. However, I still love the Dragon, and they currently have a framboise from Six Rivers brewing (Humboldt County, CA) that is wonderful. It has all the tart character you expect from a brewery of the Lembeek valley. It wouldn't beat the best lambics from Belgium, but it far outpaces the worst. Go have a pint. Deelish. 2. I have contacted the state about what to do next toward getting standards enacted. 3. Since the links for the petition have fallen off the front page, signings have slowed substantially. However, they trickle in, and we are now up to 365. If you haven't signed, it's never too late! I know that Beervana--and the sanctity of the beer world in general--should never be defiled by politics. But, since about all my attention right now is drawn unalterably to the 239,000 voters of the Iowa caucuses, I have been able to see what is going on in the beer world. My distraction will peter out by tomorrow. For now, bear with me. In Zen Buddhism, satori is the moment of sudden enlightenment when the mind realizes its own true nature. The Satori award, now in its second year and bearing its new name, honors the beer that in a single instant allows the drinker to realize the true nature of beer. I award it for the beer released in the previous year (roughly) by an Oregon brewery (roughly). Last year's winner was Ninkasi Believer. Before we honor this year's winner, a word about a beers that didn't win. In my final consideration, there were really only three contenders, and a fairly clear top two. Honorable mention to Widmer Decorator, surely one of the year's overlooked beers, and one reason why I will not forsake my allegiance to Widmer, no matter who they merge with. Truth is in the pint glass, not on the letterhead, and any brewery that can brew a beer like this earns my thanks. In practically any other year, it would be hands down the winner. (In my people's choice award, it was the winner, hands down, earning a near-majority over nine other beers.) Not only is Ira a dandy beer, but Double Mountain, from top to bottom, may well offer the best lineup of beer in Oregon. An amazing beer from an amazing brewery from whom we might expect to see a Satori winner in the future. But, sadly for Charlie and Matt, they debuted Ira in Beervana, in which legends still toil over kettles of magic elixir. And this year, they have to stand aside for one. There are many famous brewers in Oregon, and if we tried to identify the "best," we'd come down to no single name. But a case could be made for John Harris, who must hold the record for the longest list of famous beers. 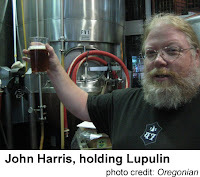 Starting at McMenamins in the formative years, moving to Deschutes during their formative years, and then ending up at Full Sail, where the company has given him his own laboratory to craft potions: Wreck the Halls, Black Gold, Vesuvius, Hopocity--the list grows by the year. He looks a little like Gandalf (with a wee bit of Gimli mixed in) and he brews like a wizard. And this year, he produced his finest beer yet. Then came the beer: an intense citrus aroma, but orange rather than grapefruit. The flavor continued in this orangey vein, agressively zesty. At the Horse Brass website, they say it has a red bell pepper note, which is close but not quite right. I kept going back to try to identify something it reminded me of; it was in comments that "KeAloha" nailed it--mango. For me, it will be the beer all green-hopped ales are judged against; it may even usher in that new, completely indigenous beer I have been hoping the Northwest would birth. Just one request to John and Full Sail: brew it again, will you? Exactly like this. I can't bear thinking I'll never taste it again. I know that "meta" commentary is mostly boring to readers, but indulge my wish to thank you all for coming by, reading, and participating. Beervana (the blog) gained a lot of readership over the year; I don't run ads or get paid to do this, so the main satisfaction I get is in knowing it's appreciated. I take it by the growing number of eyes that it is--and in turn feel enormous appreication to all of you. So thanks! 1,694 - three-month average number of unique hits per month in Jan-Mar 2007. 4,282 - three-month average fom Oct-Dec '07. 56 - per-day average readership Jan-Mar '07. 143 - per-day average readership Oct-Dec '07.